Salicru is present in Bulgaria thanks to a collaboration that it has had for several years with the engineering and energy solutions company Eurogroup-33. 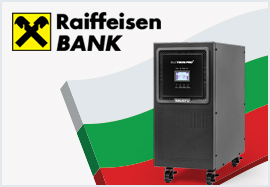 Thanks to this cooperation, 60 UPSs have recently been supplied to Raiffeisen Bank, a leading investment bank in Central and Eastern Europe. The devices supplied, which are from the SLC TWIN PRO2 series and have a power rating of 6000 VA, are destined for the electrical protection systems of various of the bank’s branches in Bulgaria. Salicru’s SLC TWIN PRO2 series UPSs feature on-line double conversion technology, currently the most advanced for the protection of critical systems as it provides a fully stabilised and filtered sine-wave supply voltage.